Assistant Professor Brit Moss in the Department of Biochemistry, Biophysics and Molecular Biology received a grant in 2016 from the National Science Foundation to study the hormone auxin and corn. In addition to working with student researchers each summer, Moss incorporates elements of the project, which is a collaboration with several other institutions, into her synthetic cell biology class. 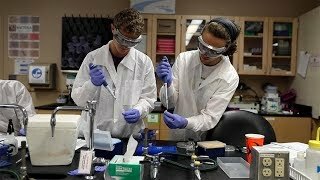 Whitman students taking the class get the opportunity to contribute to scientific research while gaining first-hand experience into the type of research life scientists do in the field.